I got sucked into the trekkie black hole when I was twelve, around the time Star Trek Voyager started. I watched Deep Space Nine too, but it was already a few seasons in by the time I started watching and didn’t hook me in quite the same way. Lately, however, I’ve been re-watching Star Trek DS9. (Thank you, Netflix. We can all relive the 90s.) Turns out there are some pretty great episodes of DS9 that I either missed (Remember how in the 90s if you weren’t home in time to watch a show, that was it? You just missed it and moved on. How did we cope?) or I didn’t fully appreciate them at the time. So I'm loving my chance to re-experience this series. There is, however, something that has come up in a few DS9 episodes that’s driving me nuts. 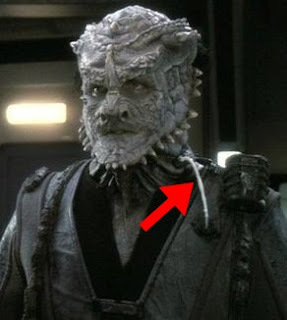 For those who are not up on their Trek trivia, the Jem’Hadar are genetically engineered soldiers. These bread-for-battle, live-to-serve-and-die warriors have a built in weakness. They are dependent on a drug, which allows their masters—the Founders—to control them. A reasonable concept. But, this drug is administered through a tube that sticks out of their necks. It kinda screams, “Hey, enemy, my weak spot is right here!” Seems like a poor design if you’re creating a race of blood-thirsty fighters. Even more frustrating than the existence of the protruding tube, no one who fights the Jem’Hadar goes for this obvious target. Tearing it out should be the only way any human stands a chance fighting hand-to-hand with an engineered fighting machine. Don’t even get me started on how these expert warriors also fall for the old ‘double fist to the back of the neck’ move that has inexplicably survived since the original Star Trek series. Not only do the Jem’Hadar always get caught unaware long enough to be hit in the back of the head, it always drops them like a stone. I guess the armour-like skin and rows of horns are just for show. There is no shortage of articles, podcasts, and how-to-write books out there discussing how to craft believable fight scenes for Sci Fi/Fantasy. Of course, in the 90s when DS9 was running the internet was not the plethora of information that it is today. Maybe that explains it. Ok, I’ll go back to suspending my disbelief now. I did choose to watch this show knowing full well hand-to-hand combat was not among its strengths.